Peaceful accommodations overlooking the hills and verdant nature – not a congested or polluted environment. Yoga Studio contained within the Residential Block – feel free to practice and sharpen your skill at any time without being inconvenienced or feeling unsafe. Provision of hot and cold running water. Internet Wi-Fi access available at less than $1 a day. 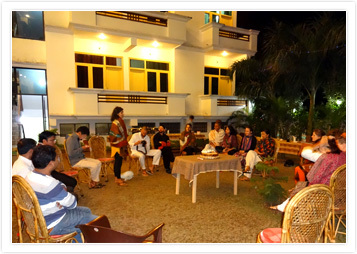 Ayurveda Center located in the adjacent premises (two minutes by foot) for those seeking a massage or a treatment. 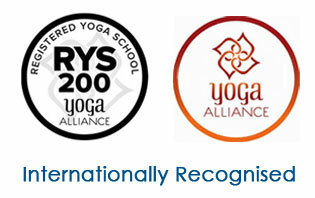 In all, at Ajarya Yoga Academy, special care is taken to make the stay conducive to learning over a longer period. 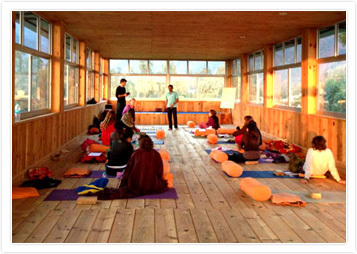 A Teacher Training program requires that indiscriminate and unhealthy eating be avoided. Unfortunately, this aspect is ignored by most schools which results in students eating out and often falling sick due to poor hygiene standards. At Ajarya, we take care to include 3 fresh meals everyday within the course fee, so that students do not have to worry about where to plan their next meal. Food is strictly vegetarian in line with the principles of yoga and sufficient variety is added, so that participants can experience different vegetables and fruits of the season. Food is fresh and made in hygienic conditions, which minimizes the occurrence of sickness. 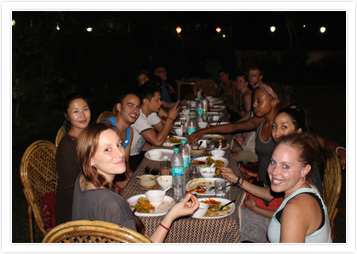 This single emphasis on fooding sets Ajarya Yoga Academy distinctively apart as a choice for a study stay.